I know, I said I would post something healthy and nutritious, but I’m not (yet). 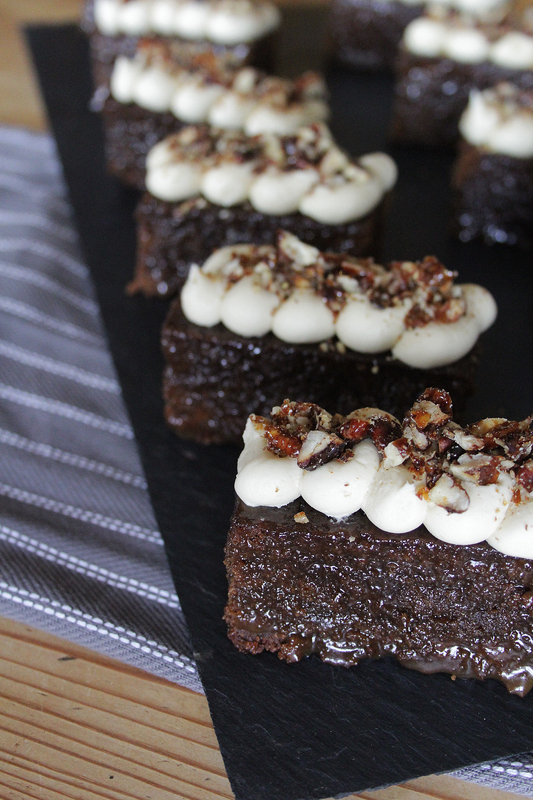 I made these sticky gingerbread bars with maple buttercream and pecan praline over Christmas and completely forgot to share the recipe (despite taking photos etc). I know they’re a little unseasonal now but it’s still winter so why not hang on to all that is spicy and indulgent?! Preheat the oven to 170c (fan). Grease and line a square brownie tray (about 20x20cm). Melt together the butter, sugar, treacle and golden syrup in a saucepan over a gentle heat. Stir occasionally then take off the heat and mix in the milk. Leave for 10 minutes to cool. In a large bowl, mix together the flour, bicarbonate of soda and spices. Make a well in the centre and crack in the eggs. Stir the eggs to break them up and incorporate some flour, then start gradually adding your buttery syrup liquid. Continue mixing (I do this with a wooden spoon) until all the liquid has been incorporated and you have a lump free batter. Pour into the prepared tray and bake for 45-55 minutes. When it is ready a skewer should come out with just a few moist crumbs attached when inserted. While the gingerbread is cooking, make the maple toffee sauce (if you’re not using shop bought); the method for this is in the ingredients list above. Once cooked turn the gingerbread onto a wire rack to cool. Now make your pecan praline. Simply place the pecans and sugar in a heavy bottom pan and heat gently until the sugar begins to melt. Tilt the pan occasionally to coat the nuts but don’t feel tempted to stir or the sugar will crystallise. 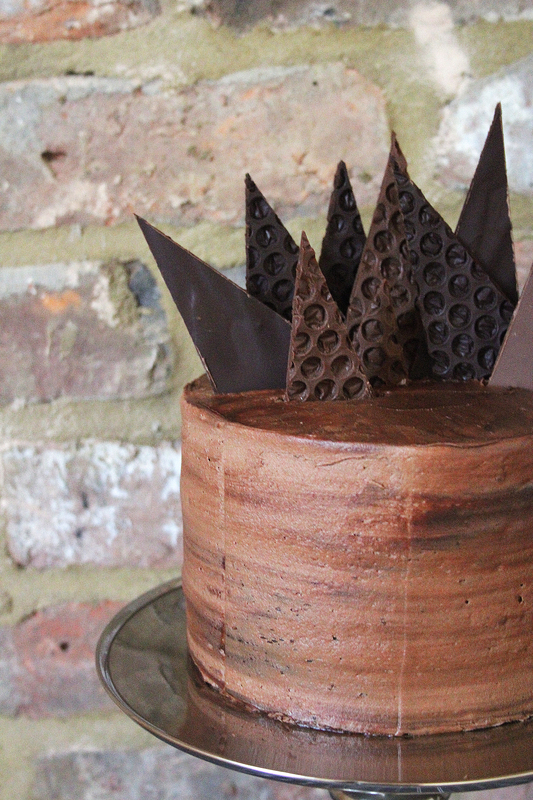 Once the sugar reaches a deep golden colour remove from the heat and pour onto a piece of greaseproof paper to set. Once hard and cool break up the praline into small pieces (or a course dust if you prefer). 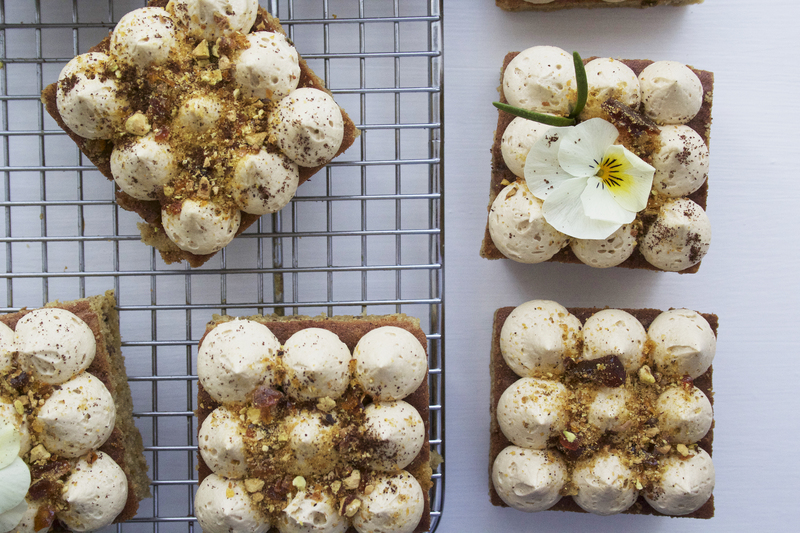 Your final step is to make the buttercream. Put the soft butter in a bowl (or bowl of a stand mixer) and whisk until light. Gradually add the icing sugar and keep whisking until you have a pale and fluffy buttercream base (this will take 5-10 minutes). Once you’ve reached this stage add the milk and toffee sauce and whisk again until it is fully incorporated. The finished buttercream should be light brown in colour. 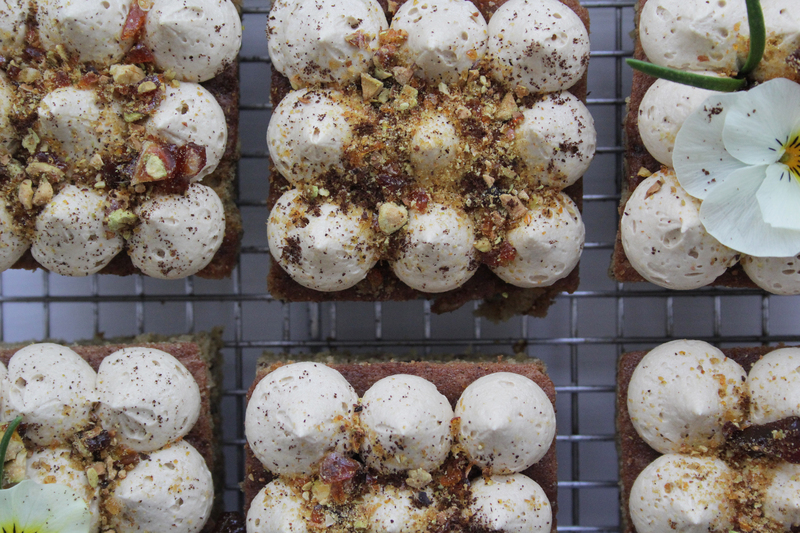 To assemble the gingerbread bars simply slice the cake into 12 fingers and drizzle with any remaining toffee sauce you might have (optional) then pipe on the buttercream. Top with the pecan praline and serve. Yesterday I made a custom cake to order (I do this most weekends, so any requests- throw them my way). This one in particular was for an eleven year old, so it was pretty fun to make and a bit different to the sort of thing I usually offer. I’m not posting the recipe as it’s a compilation of lots of the ideas already on here, but thought I would share some pictures. As it’s now officially December ( ie. 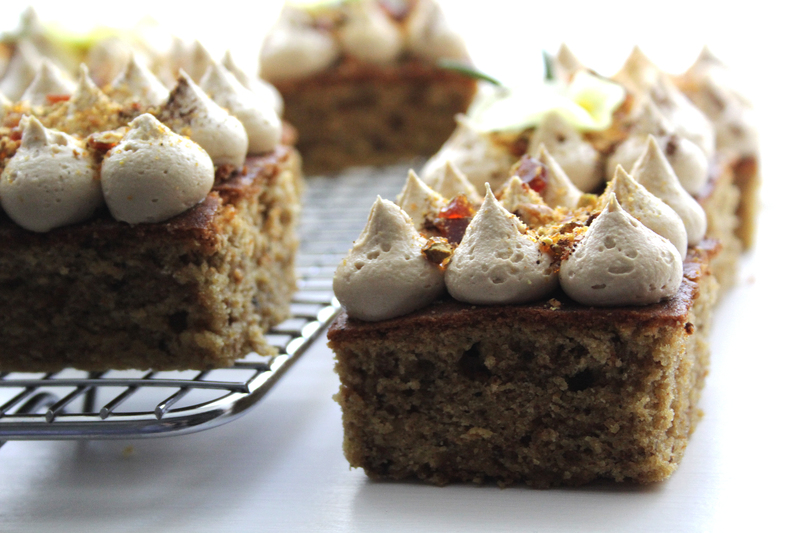 time to go Christmas mad) I thought I would share my recipe for gingerbread latte cupcakes! 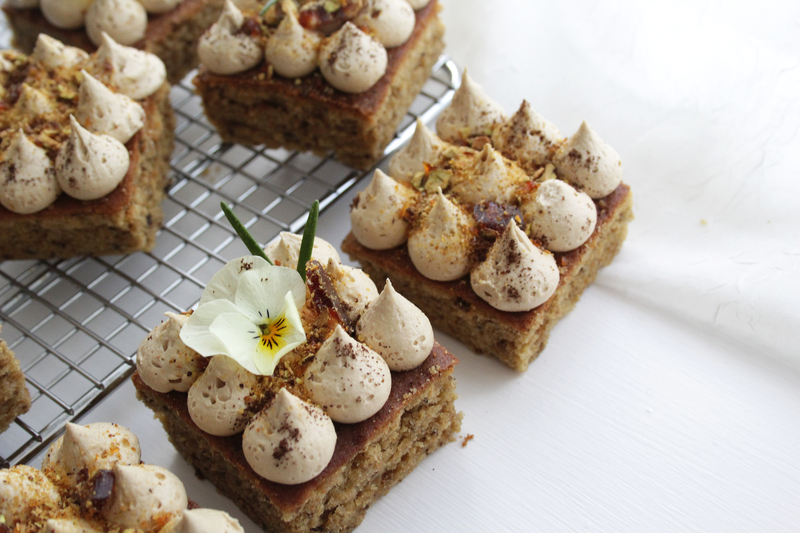 These treats are my baked take on the delicious Christmas drinks Costa and Starbucks are serving at this time of year, and are a great alternative to regular gingerbread or ginger biscuits. I’ve made little gingerbread stars to top my cakes, but you could make any shape you like, or sprinkle with glitter instead! To make the ginger cupcake mix, you will need (makes 12-15): 300g plain flour, 2tsp ginger, 1tsp cinnamon, 1tsp mixed spice, 2tsp baking powder, pinch salt, 220g caster sugar, 150g butter, 60g golden syrup, 2 eggs, 225ml milk. Preheat the oven to 190c (fan) and line a cupcake tin with cases. Sift the flour, ginger, cinnamon, spice, baking powder, salt and caster sugar into a large mixing bowl. Melt the butter then whisk together with the syrup, eggs and milk in a jug. Make a well in the dry ingredients and pour in the wet mix. Stir until well combined and you are left with a fairly loose batter. Fill each cupcake case 2/3 full and bake in the oven for 25-30 minutes. Once baked, cool on a wire rack. Using an electric whisk, combine the icing sugar, butter and espresso until very smooth. If thick, loosen with a little milk until it reaches a piping consistency. 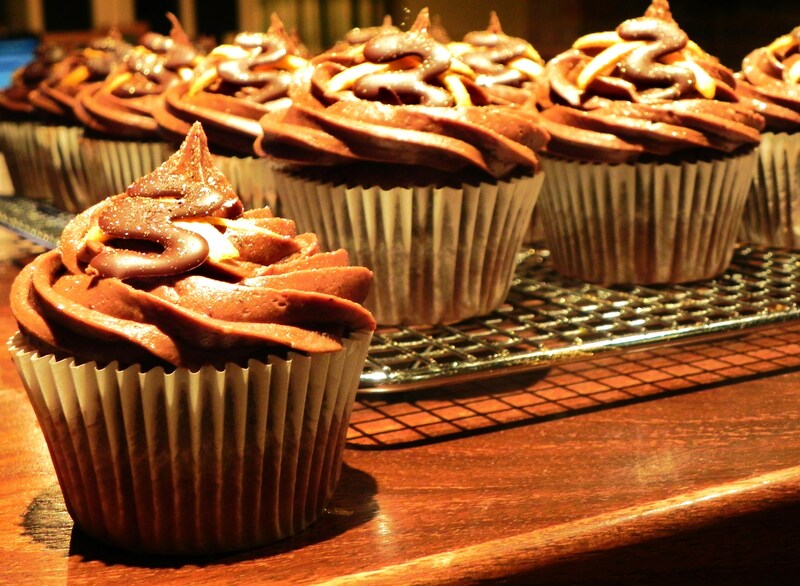 Pile the buttercream into a piping bag with a star nozzle and pipe onto the cupcakes. Top with espresso powder and some gingerbread shapes. Enjoy, and keep your eyes peeled for Christmas recipes! Do you remember the Shire, Mr Frodo? 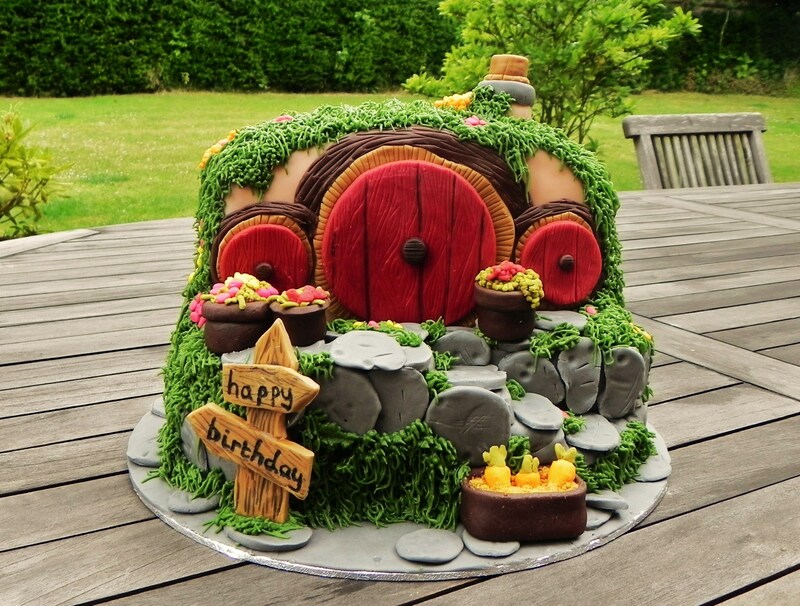 This said, I surprised myself with the result and the reception it received wasn’t too bad either (lets just say had this been Bilbo’s house, he would’ve been made homeless within an hour of its reveal). 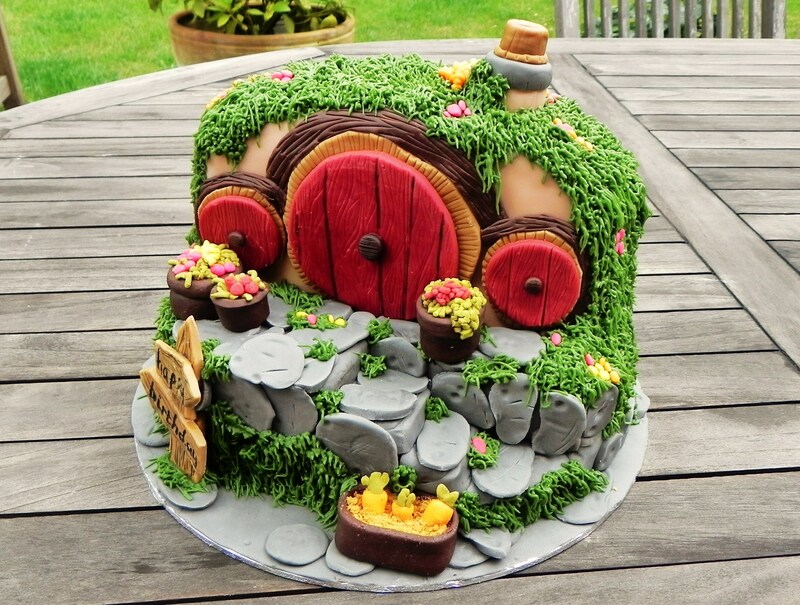 In other words, if you want guaranteed compliments, provide people with ganache, chocolate cake, buttercream, sugarpaste and nerdy cake aesthetics- it’s a winning combination. – Practice really does make perfect. I am improving every time I create a new cake. Have patience and persevere and you will see results eventually! – Don’t limit yourself to using only sugarpaste icing. 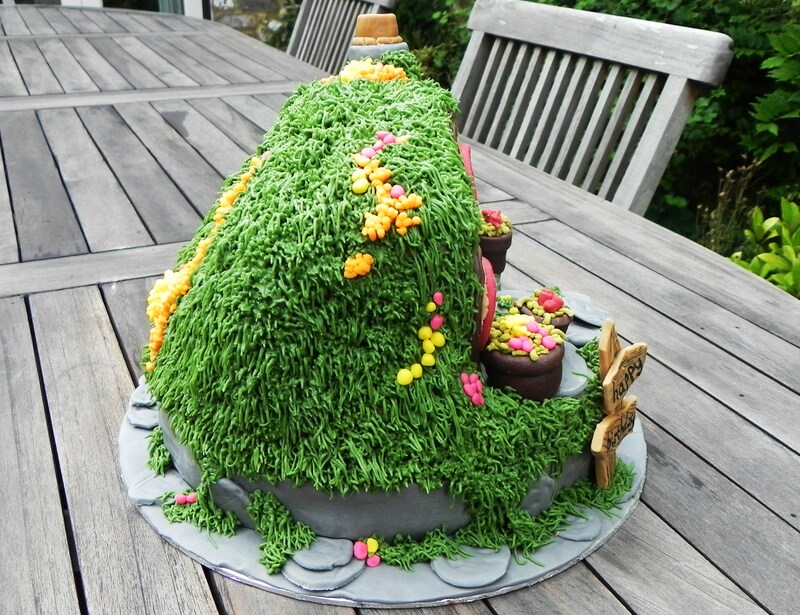 Whilst it works brilliantly for some details, it’s not always necessary ( I have used buttercream for the grass here and it’s very effective!). – Have enough tools and ingredients at your disposal. There is nothing worse than getting half way through a bake and only having half the icing needed to cover a shape- the result usually resembles a patchwork quilt! – Choose rustic designs before you attempt the seamless white wedding cake! There is more leeway with a design like this- any mistakes can be covered up if need be. –Roll icing out between sheets of greaseproof paper. I have only just realised this is the best way! Icing sugar discolours the icing and your hands make it hot and sticky. The paper keeps it fresh and smooth. 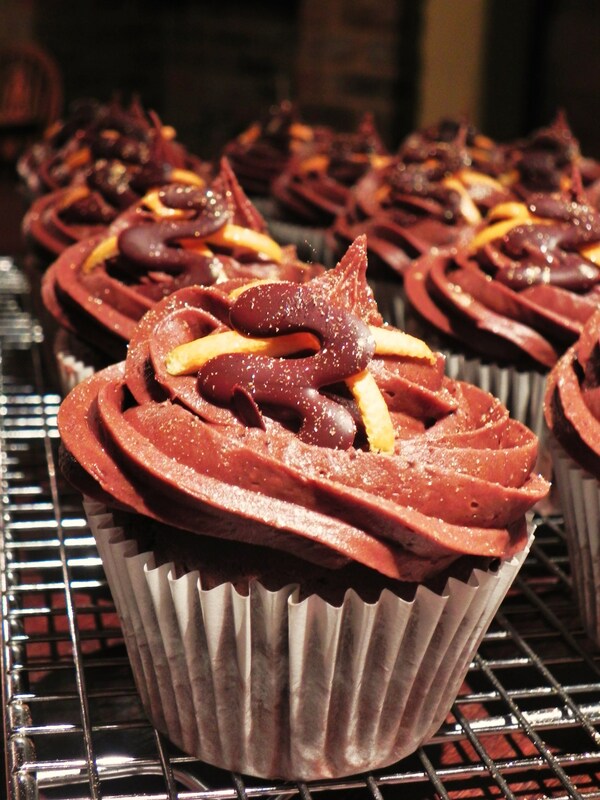 Everyone loves a chocolate orange in their stocking at Christmas, so I’ve concocted these rich chocolate orange cupcakes as a baked alternative. 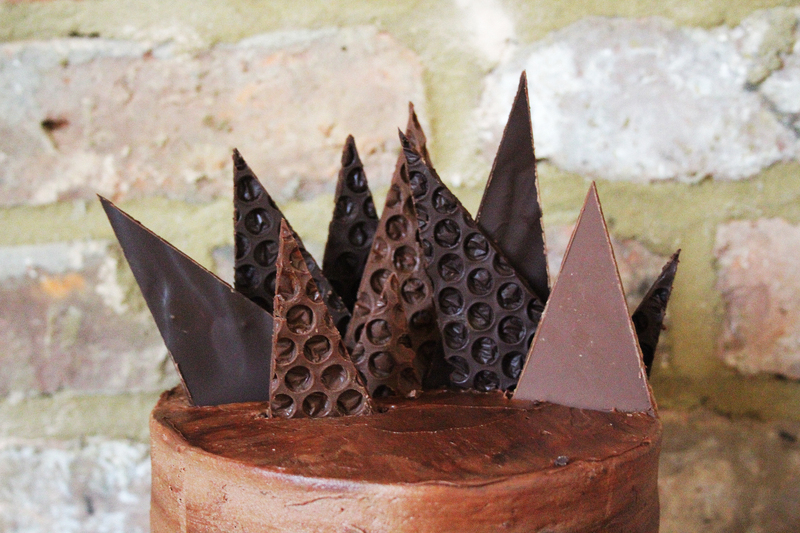 Orange spiked chocolate sponge topped with a smooth cream cheese frosting- what’s not to like!? First of all, line a muffin tray with cupcake cases and preheat the oven to 190c (fan). Cream your butter and sugars together until fluffy, then sift in your plain flour, cocoa powder, baking powder and salt. In a jug, whisk together the eggs, vanilla, milk and orange zest then add to the bowl in three additions, carefully mixing between each. Separate the mix between your cases and bake for 20-25 minutes. Remove from the oven and leave to cool. 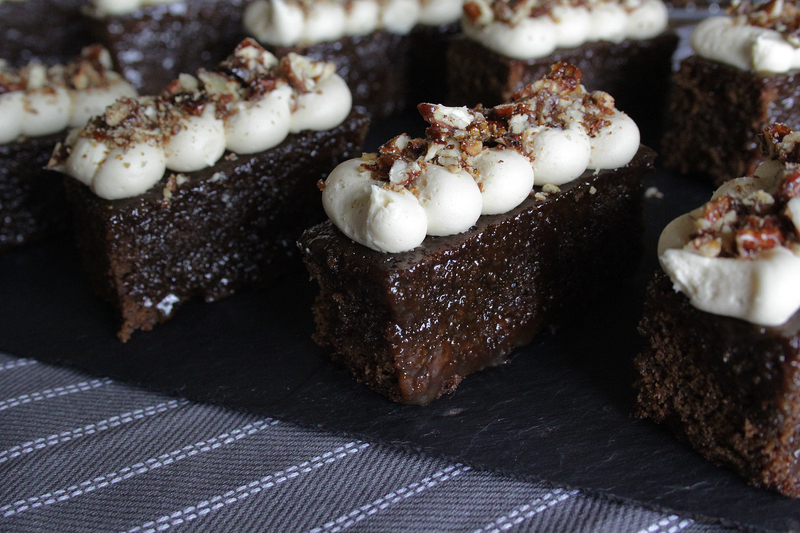 For the topping you will need: 600g icing sugar, 50g butter, 250g cream cheese, 60g cocoa powder and 2tbsp orange zest. Mix together your icing sugar, cocoa powder and butter until a crumb-like mix has formed, then add your cream cheese in three additions, mixing vigorously between each. Stir in the zest and use a piping bag to neatly top your cooled sponges (or just spread over with a palette knife, if you like). Decorate as you wish, I’ve used a little reserved orange zest, some chocolate swirls I set in the fridge, and a Christmassy flourish of glitter!